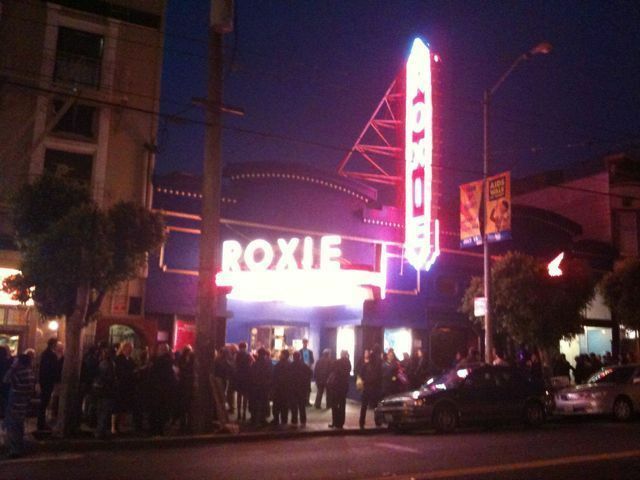 The west coast premiere of “Hell on Wheels; Gang Girls Forever” had a sold out screening at the Frameline San Francisco International LGBT Film Festival. The lines were all the way up and down the block! My film anchored a shorts program called Tough Girls which was a great selection of films including a gorgeous 9 minute film from Poland called “close enough” a 14 minute film called “organism” directed by Nina Reyes Rosenberg which was really cool, beauifully shot & well acted (except I didn’t understand the weird blood freakout scene at the end) and “Olivia” an 8 minute film with an almost horror film feel which winds up being an attempt at seduction via violin (directed by Sarah Louise Wilson) nicely shot, the shallow depth of field almost overworked but fine for a short. I found out afterward from chatting with the director that the film was shot entirely with a Canon 7D. My favorite besides my own and maybe I’m biased because I like director bug davidson was “Big Bright Future” a nice slice of life story about pot dealers in texas (a trans chick & a butch lesbian) trying to get more than 80 cents in their pockets & eating lots of candy. It was well acted & hilarious! The Frameline festival is really great; it’s well organized with something for everyone and despite its legendary status nobody here is pompous. Festival Director Jennifer Morris is super nice, chill & supportive to filmmakers. Everyone on staff follows suit. It’s a dream to be a part of this festival again. Hell on Wheels is my fourth film to screen here since 2000. I think. yeah. “Gang Girls 2000”, “Surf Gang” & “A Beautiful Death” screened here before. that’s all. We are going to join our host DP Marcia Ong for the trans march this afternoon so we will be hanging in Dolores Park. I hope the sun comes out. We have a venue for the After Party July 1st. It’s National Underground on Houston Street. Party starts right after the screening and will go as long as we wanna party. We will have a supergroup playing the soundtrack live.